Montreal’s Old Port is a curiously sentimental place. It was once a working harbour full of the sights and sounds of stevedores, their rough lodgings and Montreal’s food market. Now the shoreline bustles with tourists against the backdrop of a beautiful riverside park and the city’s most exclusive private club. Today’s scenes include city hall bureaucrats and advertising types sipping lattes in hip restaurants and hotels, while Leonard Cohen diehards upload photos of Our Lady of the Harbour, and Celine Dion devotees check out the chapel in Notre-Dame Basilica where she was wed.
Amid this picturesque setting, at the foot of McGill Street, Sid Lee Architecture has permanently moored a 52-metrelong floating Scandinavian spa named Bota Bota. The building is actually a sixty-year-old ferry that in its heyday connected the cities of Sorel and Berthier across the St. Lawrence and was later repurposed as a theatre that travelled around Quebec during Expo 67. In 2008, the enterprising Émond family bought the boat, with a touristfriendly, water-based business already in mind. 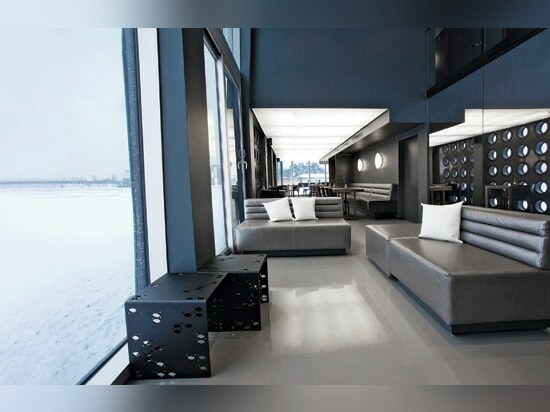 The main floor includes a public bistro / lounge with epoxied concrete flooring, a stretched PVC ceiling, custom banquettes, and signature tables in perforated acrylic. 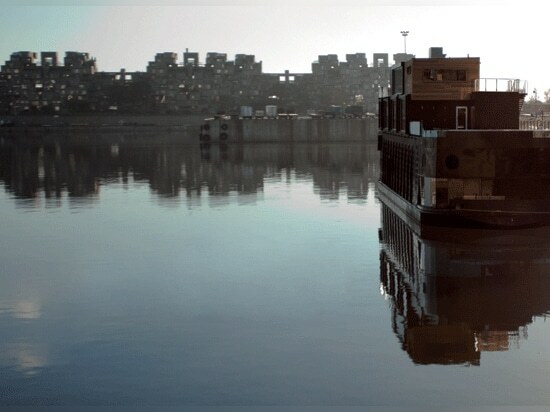 Viewed from the shore, the boat fits comfortably into the scenic post-industrial setting. It rises four levels above the waterline, and its black paint and horizontal wood cladding complement the adjacent landscape at the entrance to the Lachine Canal. When the spa glows at night, the design elements are more pronounced, in particular the 678 portholes punched into the walls on the first and second levels. For the interior, the architects opted for simplicity; their restrained concept brings attention to exceptional, amazing, dramatic views. Expanses of double-height glazing frame perspectives of the harbour and a bevy of Montreal icons, including the art deco Aldred Building, Buckminster Fuller’s geodesic dome for Expo 67, the majestic Grain Elevator No. 5, and Moshe Safdie’s signature Habitat 67 housing project. 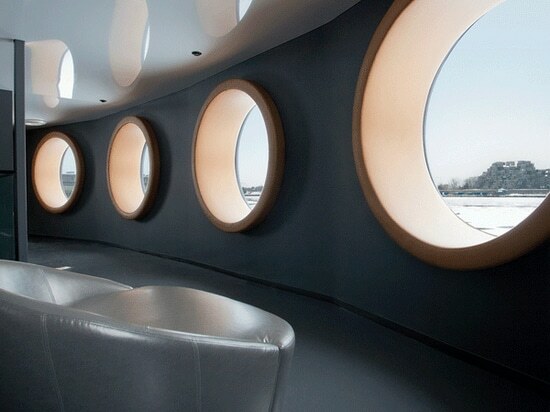 The lounge on the second level is particularly striking: the large round windows are big enough for spa-goers to curl up inside in their bathrobes and survey the river, almost as if floating downstream. And two custom-designed exterior whirlpools offer visitors a chance to take in the city panorama under the stars – a sybaritic experience, especially during a light snowfall. teamed up with the firm to form Sid Lee Architecture. 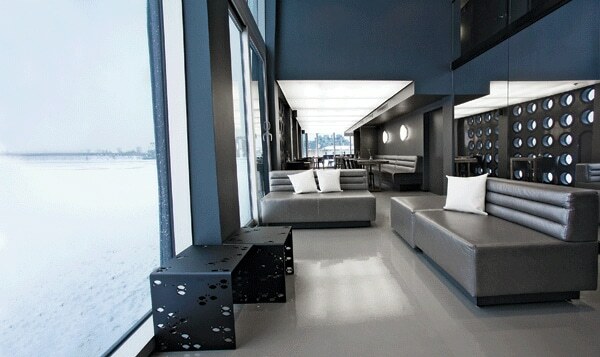 Pelland and Leblanc had worked with the Émonds previously, designing the Balnéa spa in Quebec’s Eastern Townships. Sid Lee contributed marketing, branding and graphics to the Bota Bota project. 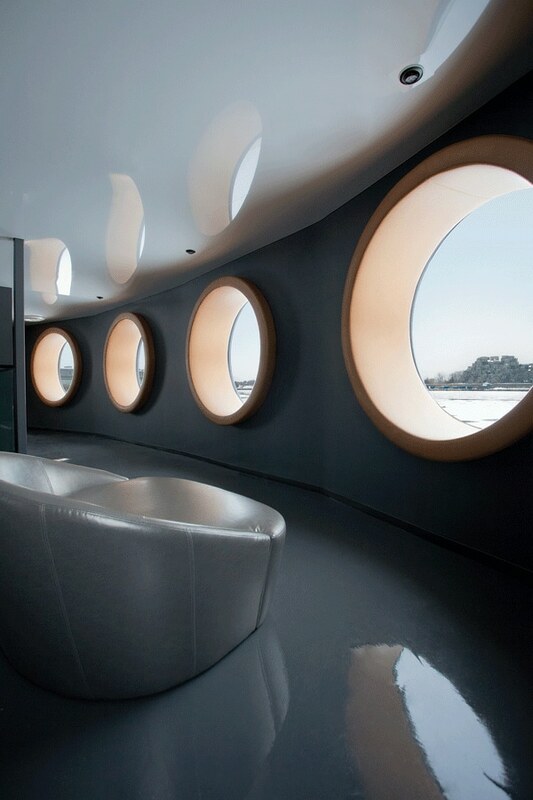 A multi-purpose room on the second level features six portholes big enough to lounge in. 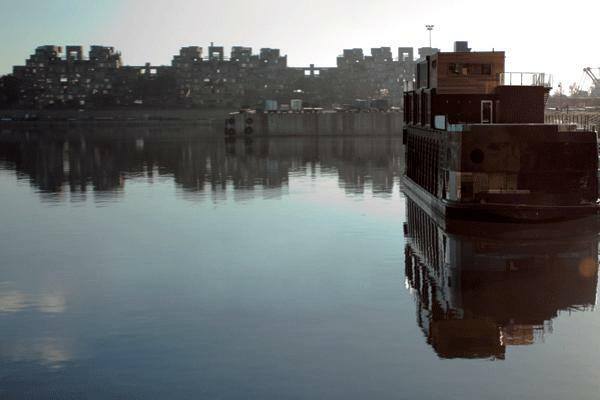 The architects had few examples of floating spas to draw from, therefore much of their energy went into solving problems more familiar to boat owners: for instance, how do you move people from the nearby street down to the dock? To reach the spa, visitors must pass over a small bridge, amble down a winding path, and then cross a gangway in front of an intimidating set of metal exit stairs. For heating and cooling, the architects used an energy-efficient geothermal system. But because the adjoining land is leased rather than owned, it made no sense to drill a well. Instead, they installed an open geothermal loop in a reservoir, a water-based method typically only used on navy and cruise ships. Two outdoor whirlpools are located on the third-and fourth-level decks. 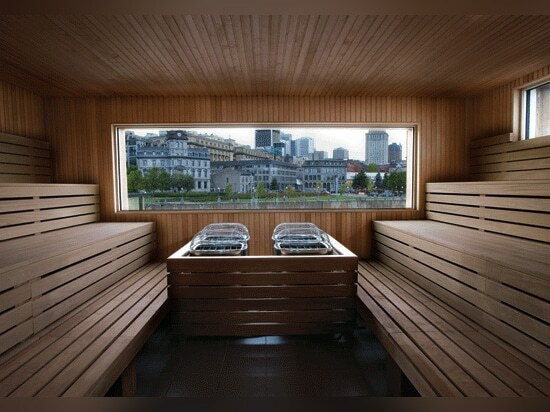 Outdoor showers are installed on the wall behind a large polygonal pool; above, clad in cedar, is the larger of the two saunas. Overall, the design makes few concession to the naval aesthetic. Double-height reception areas are simply carved out of the second-level deck, and a simple elliptical metal and wood stair links the interior levels. There are locker rooms in the former engine rooms, below the waterline; massage and therapy rooms at midship; and saunas, a steam room and lounges on the two top floors. The architects overhauled the ship in dry dock, reconfiguring the steel hull to make the boat float a little higher, and to hold up to 250 guests and 50 staff. They also made a series of decisions to keep the mass down: metal lockers instead of teak, lightweight concrete floors coated in epoxy, and a new steel structure on the upper bridge. Ample glazing on the two top floors makes the most of the stupendous views while creating a seamless indoor / outdoor flow. At just 3,150 square metres, this was a surprisingly challenging project for both the client and the architects. “We definitely pushed for innovative solutions due to the great number of constraints,” says project architect Jean Pelland. “That made the process harder than usual.” But the spa’s straightforward grace belies the hard work involved in the renovation, and the concept is exemplary: it’s a pretty project in an ideal place – and those views! 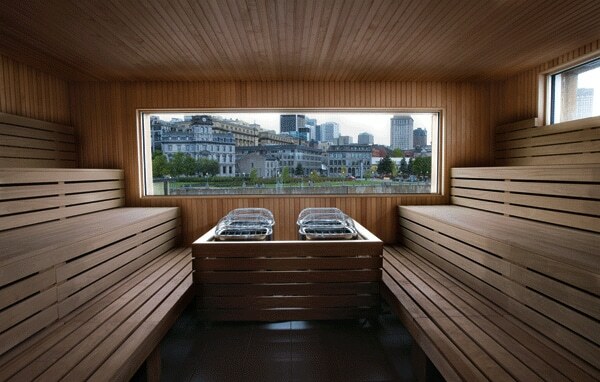 On a former ferry permanently moored at the foot of McGill Street, Bota Bota offers views of Habitat 67 across the river and the Old Port of Montreal, framed by the window in the sauna on the topmost deck. Locker rooms occupy the former engine room.